The British summer has a habit of disappointing but that doesn’t stop everyone getting excited about a summer marketing campaign. 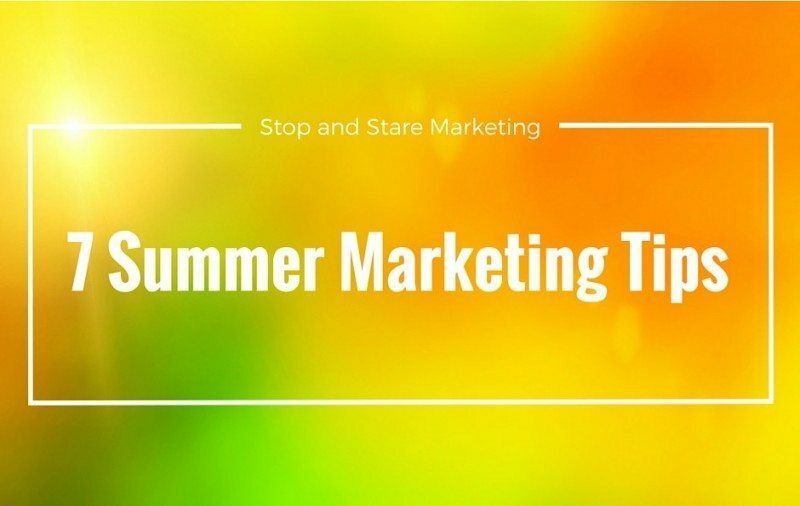 Just like Christmas you only have to add the word ‘summer’ to your marketing campaign to increase your email open rates, or gain traction using seasonal hashtags on Instagram and other social media platforms. You don’t need to be selling a seasonal product to benefit either. We’re running summer branded email campaigns for B2B clients, brightening up workplace inboxes around the country! So, if you’re looking for inspiration here are 7 ways you could capitalise on summer, rain or shine. Local businesses can do well by aligning themselves with seasonal events in the area. This could be by sponsoring a float in the local carnival, or targeting fetes and festivals with flyers, balloons and more traditional print marketing. Promotional offers, competitions and prizes will help you keep your flyers out of the recycling bin, and balloons, banners and car decals will ensure everyone in the area knows about your business. An email reminding the recipient that summer holidays, carefree weekends, BBQs and trips to the beach are just around the corner is bound to get their attention. While B2C businesses may have seasonal products to sell, B2B organisations can also jump on the summer bandwagon. How about running a summer offer for new clients at a time that may be quiet for your business: get people signed up now and by September you could have increased your client base substantially. Whether you’re promoting a product, sharing tips or linking to a blog post, your social media profiles should also reflect the season. Think about the images you use on all of them, and make sure they have a summery vibe. This includes corporate imagery such as stock photos reflecting business concepts and situations. Instead of choosing a photo of a businessperson in suit and tie, how about one with their shirts rolled up and sunshine streaming through the window? Here in the UK any social media updates about the weather are bound to get engagement – we all love to moan about our British summers. So even those throw away comments about what a beautiful day it is / isn’t, or plans for summer holidays can help your business build relationships with your customers. Even better if you can support those updates with relevant products or services. You could start your own hashtag on Twitter or Instagram and start a new trend, or jump on the back of an existing one and further your businesses reach this way. A handy tool called IceRocket.com can help you find out what hashtags are trending on Twitter, and how often they’re being used. With Instagram start searching using #summer, to see what other people are saying. Another great way to grab peoples’ attention is with a free giveaway. What would your customers really appreciate this summer? Could be a delivery of ice lollies to their office on a hot day, branded flip-flops for wearing around the pool, a beach ball, cool bag (filled with goodies) or a travel phone charger for their long haul flight. There are loads of products you can have branded, but even better make it relevant to your company. For example if your customers are office based you’ll get more mileage out of a branded product they can use in the office, such as a hand-held fan or the ice lollies mentioned above. Many businesses suffer from a bit of a lull during the summer months, unless you operate in the travel sector. Now is a great time to work on your marketing strategy for the autumn and winter, so you’re ready to get busy when everyone returns from their holidays. You may think it’s funny working on Christmas advertising during a heat wave (wishful thinking), but that’s what big brands will already doing – the snowy scenes in John Lewis’ ‘Man on the Moon’ Christmas campaign were actually shot in a Brighton council estate in August! To get more tips and insights like this why not follow us on Facebook? We’re always sharing campaigns we like that you might find helpful for your marketing campaigns. Click here to like our Facebook page.